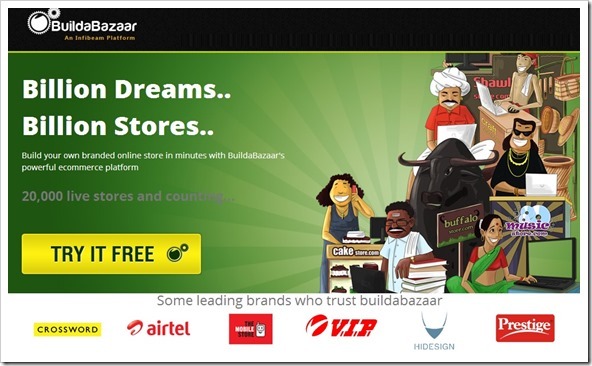 Infibeam’s B2B ecommerce platform BuildaBazaar.com has announced that they have achieved sign-ups of over 20,000 small and medium sized retailers in India. According to the press release sent to us, in terms of number of retailers on board, they have now become top SAAS Ecommerce platform in India. Over last few years, India has seen many new SAAS ecommerce platforms launched including Martjack, Zepo, Shopnix, Shopify among others. All of them focus on small and medium sized businesses who want to sell their products online, but do not have the wherewithal to set-up their own ecommerce store from scratch. SAAS Ecommerce platforms like BuildaBazaar & others offer everything these SMEs require to create an online shop, from product listings, custom shopping carts and payment gateways. Some of them even offer logistics clubbed with their offerings. The numbers (20,000 signups) released by BuildaBazaar, if true, shows significant traction. In comparison, Martjack, which was launched before BuildaBazaar has 2000 online stores on their platform (as per their about us page). Recently, Shopify forged a partnership with India’s largest telecom provider Airtel, which should give them a good lead compared to other. Interestingly though, BuildaBazaar lists Airtel as one of its major customers who have online store on their platform. Some of other BuildaBazaar clients include Crossword, Hidesign , Prestige TTK and The Mobile Store. One aspect about BuildaBazaar that needs to be looked closely are the number of actual stores that are active. The press release mentions that they have 20,000 signups, but does not mention number of active online stores, or any details on the number of transactions executed on their platform.